The dictionary definition of the word “Dogma” states: A belief or set of beliefs that is accepted by the members of a group without being questioned or doubted. At Cigar Dojo, our dogma is that cigar smokers should “Never Smoke Alone“. And it’s that sense of community and attitude of fellowship that is also shared by Drew Estate’s Jonathan Drew and Smoke Inn’s Abe Dababneh. Therefore, when Master Sensei approached Jonathan and Abe about creating a new cigar to celebrate the Cigar Dojo community, it was a “no brainer”. While Jonathan’s dad “Baitfish” Gary came up with the name “Dogma”, Master Sensei, Abe, and Jonathan worked hard to create a new version of the popular Undercrown cigar that tastes and smokes like no Undercrown before it. The blend of “Dogma” is based on the Undercrown Corona ¡Viva! which means it will feature a bit more “kick” than a regular Undercrown. The Dogma is also box pressed, which has never been used on any Undercrown. It’s the box press shape that helps the tobaccos marry together in glorious fashion, coating your mouth with a creamy chocolatey spice and a subtle, vanilla undertone. If you enjoy the Corona ¡Viva! but would like a longer, 56 ring gauge smoke, the “Dogma” will be a new favorite. The Dogma is comprised of Mexican San Andreas wrapper, Connecticut Stalk-Cut Habano binder, and Nicaraguan & Brazilian Mata Fina fillers. The “Dogma” will come in a 6 x 56 box-pressed vitola. The Undercrown Dogma features a gorgeous sub-band with “Cigar Dojo Commemorative Cigar” on the front and Master Sensei on the back. The “Dogma” will be a limited run of 10-count bundles, and will be sold exclusively through Smoke Inn, a South Florida cigar retail chain, owned by Abe Debabneh. For those based outside of Florida, the cigars will also be available through Smoke Inn’s web store. The “Dogma” will be priced at $9.95 MSRP per single and $99.50 MSRP per 10-count bundle. Cigar Dojo members will have first crack at grabbing these commemorative cigars. The Undercrown “Dogma” will be available for pre-order Friday, March 28th, 2014, through SmokeInn.com. You can get the link to pre-order on the Dojo on Friday (details will be given on the Dojo when they are available). After the Friday Dojo-pre-order, the Dogma will go on sale to the general population on Saturday March 29th. 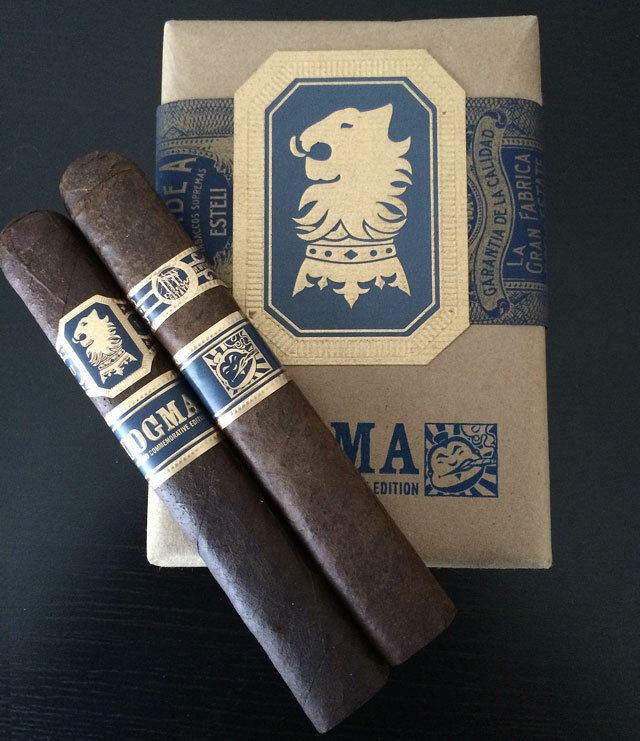 The box-pressed 6×56 Dogma comes in 10 count bundles featuring the Cigar Dojo logo on the front. Want to get your hands on the Dogma even sooner? Enter the contest to win a free bundle of these special, limited edition cigars.